At least for today (perhaps because I’m a little under the weather), when it comes to the Fed I’m about all ranted out. So this isn’t supposed to be a rant, but more an effort to tie together some loose analytical ends. Key facets of my Macro Credit Theory analysis seem to be converging: The myth of deleveraging, “liquidationist” historical revisionism, Rules vs. Discretion monetary management, and “Keynesian”/inflationist dogma. The Bernanke Fed this week increased their quantitative easing program to monthly purchases of $85bn starting in January. “Operation Twist” – the Fed’s clever strategy of purchasing $667bn of bonds while selling a like amount of T-bills - is due to expire at the end of the month. The Fed will now continue buying Treasury bonds ($45bn/month). It just won’t be selling any bills, while continuing with $40bn MBS purchases each month. The end result will be an unprecedented non-crisis expansion of our central bank’s balance sheet (monetization). It’s Professor Bernanke’s “government printing press” and “helicopter money” running at full tilt. During his Wednesday press conference, chairman Bernanke downplayed the significance of the change from “twist” to outright balance sheet inflation. Wall Street analysts have generally downplayed this as well. Truth be told, no one has a clear view of the consequences of taking the Fed’s balance sheet from about $3.0 TN to perhaps $4.0 TN over the coming year or so. It’s worth noting that in previous periods of rapid balance sheet expansion, the Fed was essentially accommodating de-leveraging by players (hedge funds, banks, proprietary trading desks, REITs, etc.) caught on the wrong side of a market crisis. Does the Fed’s next Trillions worth of liquidity injections spur more speculation in bonds, stocks and global risk assets? Or, instead, will our central bank again provide liquidity for leveraged players looking to sell (many increased holdings with the intention of eventually offloading to the Fed)? It’s impossible to know today the ramifications of the Fed’s latest tack into uncharted policy territory. It will stoke some inflationary consequence no doubt, although the impact on myriad Credit Bubbles around the globe is anything but certain. Clearer is that the Fed has again crossed an important line. There has been previous talk of Fed “exit strategies.” I’ll side with Richard Fisher, president of the Federal Reserve Bank of Dallas, who Friday warned of “Hotel California” risk ("...Going back to the Eagles song which is, you can check out any time you want but you can never leave…"). There has also been this notion that the U.S. economy is progressing through a (“beautiful”) deleveraging process. Yet there should be little doubt that the Fed has now resorted to blatantly orchestrating a further leveraging of the U.S. economy. It will now become only that much more difficult (think impossible) for the Federal Reserve to extricate itself from this Inflationary Process. I’ve read quite sound contemporaneous analysis written during the “Roaring Twenties.” There was keen appreciation at the time for the risks associated with rampant Credit growth and speculative excesses throughout the markets and economy. The “old codgers” argued that a massive Credit inflation that commenced during the Great War (WWI) was being precariously accommodated by loose Federal Reserve policies. Chairman Bernanke has throughout his career disparaged these “Bubble poppers.” To this day the “liquidationists” are pilloried for their view that there was no viable alternative than to wring financial excess and economic maladjustment out of the system through wrenching adjustment periods. Through their empirical studies, quantitative models, and sophisticated theories, contemporary academics – led by Dr. Bernanke – have proven (without a doubt!) that the misguided “Bubble poppers” and “liquidationists” were flat out wrong. Our central bankers are now determined to prove them (along with their contemporary critics) wrong in the real world. Yet there remains one rather insurmountable dilemma: The contemporaneous Credit Bubble antagonists were right. Inflationary cycles always create powerful constituencies. After all, Credit booms and the government printing press provide incredible wealth-accumulating opportunities for certain segments of the economy. Moreover, it is the nature of things that late in the cycle the pace of wealth redistribution accelerates as the monetary inflation turns more unwieldy. Throw in the reality that asset inflation (financial and real) has been a prevailing inflationary manifestation throughout this extraordinary Credit boom, and you’ve guaranteed extraordinarily powerful constituencies. By now, “activist” central banking doctrine – with pegged rates, aggressive market intervention/manipulation and blatant monetization - should already have been discredited. Instead, policy mistakes lead to only bigger policy mistakes, just as was anticipated generations ago in the central banking “Rules vs. Discretion” debate. Today, a small group of global central bank chiefs can meet in private and wield unprecedented power over global markets, economies and wealth distribution more generally. They are said to somehow be held accountable by politicians that have proven even less respectful of sound money and Credit. In the U.S., Europe, the UK, Japan and elsewhere, central bankers have become intricately linked to fiscal management. As such, disciplined and independent central banking, a cornerstone to any hope for sound money and Credit, has been relegated to the dustbin of history. Considering the global monetary policy backdrop, it’s not difficult to side with the view of an unfolding inflation issue. At the same time, the “liquidationist” perspective - that to attempt sustaining highly inflated market price and economic structures risks financial and economic catastrophe - has always resonated. The markets’ response to Wednesday’s dramatic Fed announcement was notably underwhelming. This could be because it was already discounted. 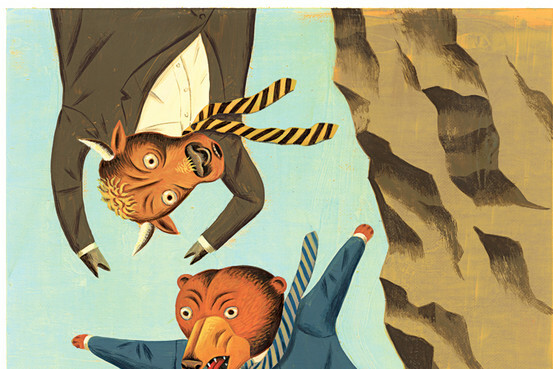 Perhaps “fiscal cliff” worries are restraining animal spirits. Then again, perhaps the more sophisticated market operators have been waiting for this opportunity to reduce their exposures. After all, the Fed moving to $85bn monthly QE five years into an aggressive fiscal and monetary reflationary cycle is pretty much an admission of defeat. I’ve argued that, primarily due to unrelenting fiscal and monetary stimulus, the U.S. economy has been avoiding a necessary deleveraging process. Some highly intelligent and sophisticated market operators have argued the opposite. They point to growth in incomes and GDP, while total (non-financial and financial) system Credit has contracted marginally. I can point specifically to Total Non-Financial Debt that closed out 2008 at $34.441 TN and ended September 30, 2012 at a record $39.284 TN. But the deleveraging debate will not be resolved with data. The old “liquidationists” (and “Austrians”) would have strong views about contemporary “deleveraging”. They would shout “inflated price levels,” “non-productive debt,” “unsupportable debt loads,” “excess consumption,” “distorted spending patterns and associated malinvestment,” “deep economic structural imbalances” and “intractable Current Account Deficits!” They would argue that to truly “deleverage” one’s economy would require a tough weaning from system Credit profligacy. Only by consuming less and producing more can our economy reduce its debt dependency and get back on a course toward financial and economic stability. The “Bubble poppers” would profess that in order to commence a sustainable cycle of sound Credit and productive investment first requires a cleansing (“liquidation”) of unproductive ventures and unserviceable debts. It’s painful and, regrettably, shortcuts only short-circuit the process. I’m convinced that they would hold today’s so-called “deleveraging” – replete with massive deficits, central bank monetization and ongoing huge U.S. trade deficits - in complete and utter disdain. In a CNBC interview Wednesday evening, the Wall Street Journal’s Jon Hilsenrath called Dr. Bernanke a “gunslinger.” Our Fed chairman is highly intelligent, thoughtful, polite, soft-spoken, seemingly earnest and a huge, huge gambler. And he’s not about to fold a bad hand. Almost four years ago, I wrote that Fed reflationary measures were essentially “betting the ranch.” This week they again doubled down. With his perspective and theories, Dr. Bernanke has pushed the envelope his entire academic career. He is now surrounded by a group of likeminded “Keynesian” academics, and they together perpetuate groupthink in epic proportions. These issues will be debated for decades to come – and who knows how that will all play out. But as a contemporary analyst and keen observer, there’s no doubt these unchecked “academics” are operating with dangerously flawed theories and doctrine. It’s not the way central banking was supposed to work. Ditto Capitalism and democracies. Whatever happened to sound money and Credit? Despite fiscal-cliff fears, the U.S. stock market could rise 10% in 2013, say Wall Street's top strategists. Betting on a better economy, foreign sales, and technology and energy shares. Wall Street's equity strategists know that predicting the market's performance involves both skill and luck. This month's knotty negotiations among lawmakers over the so-called fiscal cliff -- looming automatic spending cuts and tax hikes -- greatly complicate the job of forecasting next year's market returns. Yet if there is one thing that makes market seers -- and investors -- comfortable about 2013, it is stocks' big rally in 2012. Success breeds confidence, after all, and a year-to-date advance of 12% in the Standard & Poor's 500 surely qualifies as success. 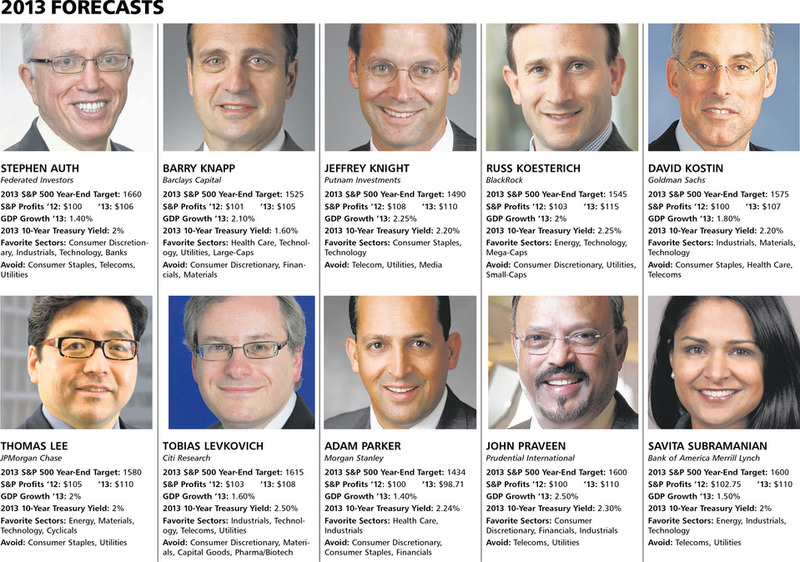 The 10 strategists recently surveyed by Barron's see more gains ahead next year. Their mean S&P prediction for 2013 -- 1562 -- implies a 10% price gain from current levels. If Republicans and Democrats don't reach a deal before year end on taxes and spending, news about the progress of their talks could ratchet up market volatility in coming months. But at this point, the Street's bulls are more bullish about the year ahead than they were a year ago, while the bears are relatively less bearish. S&P 1562, IF BORNE OUT, would come within a hair of the index's all-time high of 1565, hit in October 2007. Indeed, a majority of strategists consulted have 2013 year-end targets above that peak, and some of them, at or above 1600. Ironically, a stronger conviction about stocks comes despite the strategists' predictions of ho-hum growth next year in corporate earnings. Their mean forecast for S&P 500 profits is $108 a share, up 5% from this year's estimated $102. The seers are emboldened by other factors, however, which hampered stock prices in 2011 and much of 2012. Financials have gone from worst to first this year, while utilities have done the opposite. It has been a good year for materials, too. *Based on analysts' 2013 earnings estimates. **Through 12/13. A year ago, November's election clouded the outlook, and the Republicans' bitter primary-season campaign had begun. Now the outcome is settled, with President Obama returning to the White House for a second term. Worries about Europe's sovereign debt have eased significantly, as well, at least in the ability of the crisis to shock U.S. investors. The Continent's problems are far from over, given the unsustainable borrowing costs of several euro-zone members, but the whiplash-inducing anxiety on these shores is gone. Concerns about slowing economic growth in emerging markets, in particular China, also have begun to dissipate. There are even hints in recent data that these economies have bottomed. In short, the prevailing view is that U.S. stocks will skirt around the potholes that remain. This month, strategists and their clients are focused on the game of chicken Democrats and Republicans seem to be playing at the edge of the fiscal cliff. The president is insistent on raising tax rates for the wealthiest Americans, while the GOP, in simple terms, seeks to broaden the tax base instead. Most prognosticators expect the feuding parties to reach some kind of deal on new taxes and spending cuts, but when? Few see a "grand bargain" between the factions by the Dec. 31 deadline, but nor do they see a bruising six months ahead. Instead, the consensus holds that a preliminary agreement will be reached in the first months of 2013. That would mitigate the enormous fiscal drag that likely would result if the mandated tax cuts and spending sequestrations, which snap into effect Jan. 1, were to remain in force for much of the year. "A fiscal-cliff deal is increasingly likely," says John Praveen, chief investment strategist at Prudential International Investment Advisers. While politicians bicker, he notes, there's plenty of liquidity in the financial system, and the Federal Reserve is committed to keeping interest rates low, which should keep the economy out of serious trouble. Last week the Fed confirmed its low-rate stance yet again, saying it will buy up $85 billion of mortgage-backed and Treasury debt per month to drive down long-term rates. "If the fiscal-cliff uncertainty dissipates and Europe stabilizes further, we might get a bit of an expansion in the market's price/earnings ratio," Praveen adds. Corporate spending and hiring could start rebounding, too, and economic growth could accelerate. Stocks currently trade for 13.1 times next year's estimated earnings. Using strategists' mean 2013 S&P price target, the P/E expands to 14.5. That's not dirt cheap, but it is far from nosebleed territory, and well below levels seen in the early 2000s, as the chart nearby attests. Faster global growth could bode well for technology and industrial outfits and their shares, the strategists say. Some also view the energy sector favorably. Mega-capitalization companies such as Caterpillar (ticker: CAT), which makes heavy equipment, and Qualcomm (QCOM), a specialist in wireless-communications equipment, likewise could outperform. Stocks large and small have rallied in 2012, along with bonds, which some say are overvalued. Gold has maintained its shine, but oil is cheaper. Companies in more defensive sectors, including consumer staples, telecoms, and utilities, are expected to underperform, especially as they sport rich valuations but offer sluggish earnings growth. Domestically focused companies and small-capitalization stocks likewise could suffer on a relative basis, as investors move up the capitalization scale to capture faster-growing foreign revenue. Most strategists view the government fixed-income market with a skeptical eye, and many believe Treasury-bond prices will fall as U.S. and international economic growth accelerates. Of course, predicting that the "bond bubble" will burst is old hat by now, so contrarians, please take note. Here's a closer look at the lay of the investment land as 2012 segues to 2013. While a timely resolution to the fiscal-cliff negotiations is a centerpiece of the bulls' view, some tax hikes and spending cuts almost surely are in the offing. "We are going to have fiscal drag one way or another," says Barry Knapp, a strategist at Barclays, who has a year-end target of 1525 for 2013. Russ Koesterich, BlackRock's global chief investment strategist and a newcomer to our survey, notes that more fiscal drag will mean lower earnings growth and less expansion in the market's price/earnings multiple. "It is very unlikely there will be a 'grand bargain' in the next few weeks," says Koesterich, who has an S&P 500 target of 1545. Thomas Lee, chief U.S. equity strategist at JPMorgan Chase, is a bit more sanguine. He estimates that the combined effect of tax increases and spending cuts could trim gross domestic product by 1.5% next year. But that wouldn't be enough to derail what would be the bull market's fifth year next year, he avers. Lee, who has a 2013 S&P price target of 1580, estimates that federal cuts in defense spending clipped 1% from GDP this year, while contractions in state and municipal spending shaved 1.5% from economic growth in 2011. "We've already had fiscal drag for two years now," he says. Even the most optimistic market watchers concede that stocks could have a bumpy ride as politicians hash things out. Says Savita Subramanian, head of U.S. equity and quantitative strategy at Bank of America Merrill Lynch, "it won't be a straight line" to her S&P target level of 1600. Stephen Auth, Federated Investors' chief investment officer, is concerned about the short term, as well, although his year-end S&P target, 1660, is a high for our group of 10. He's betting investors eventually will return to the market in force as concerns about global growth ease. "A pullback of 5% to 10% is coming," says Auth, who would view such a selloff as an opportunity to invest at lower prices. The market multiple, he says, could expand later if the "risk environment" improves. "Part of the reason the market's P/E isn't higher is the recognition that we can't run the economy with a trillion-dollar government deficit each year," Tobias Levkovich, chief U.S. equity strategist at Citi Research, says. He, too, expects some improvement in the market's multiple this year. Unless fiscal-policy talks break down completely, a recession is unlikely in 2013. But not every strategist looks for stocks to rise sharply. Adam Parker, Morgan Stanley's U.S. equity strategist, has the lowest S&P target in our group -- 1434. "Macroeconomic factors are telling us that earnings will be flat in 2013," says Parker, who sees slowing GDP growth, weaker consumer confidence, and restrained manufacturing activity. Parker estimates S&P 500 companies will earn $100 next year. That could mark the trough before profits start rising again in 2014, he says. Industry analysts, or "bottom up" forecasters, typically have a brighter earnings outlook than strategists, or "top down" folks. That's true for 2013, too, as the strategists see earnings climbing to $113. Interestingly, the market finished flat in 2011, yet earnings rose 15%. Although profit growth looks less than stellar, the market's confidence is enhanced by reduced volatility in S&P earnings trends, says Subramanian of BofA Merrill. Massive losses in 2008-09 were followed by fat profits in 2010. Subramanian sees "a more normal environment" for earnings in 2011-13, and the reduction in volatility could send P/E multiples higher. If all goes according to bullish plan, the economy will gather strength as the year unfolds. "We anticipate a year of accelerating economic strength, which will translate into outperformance of cyclical sectors," says David Kostin, chief U.S. equity strategist at Goldman Sachs. The bank is forecasting that U.S. GDP will expand at an annualized rate of 3% in the first quarter of 2014, up from an expected 1.5% in the first quarter of next year. The market will favor growth over yield next year, and U.S. equities will beat bonds, predicts Kostin, whose S&P 500 target is 1575. Among the stocks in his recommended portfolio, he likes energy-services provider Noble (NE) for its combination of strong earnings visibility and revenue-growth potential. A large portion of revenue is generated from the BRICs -- a Goldman-coined term referring to Brazil, Russia, India, and China. The year ahead could be especially kind to U.S. companies with substantial foreign exposure. "It's time to close the domestic stock trade," Subramanian says. Shares of U.S.-focused companies have grown expensive and now trade at decade-high valuations relative to multinationals. Since 2001, the valuation premium of the top decile of the S&P 500 as measured by foreign exposure has dropped to 10% from an average 50%, according to the BofA Merrill Lynch analyst. ...while Broadcom and Molson Coors lead in percentage terms. Many tech and energy outfits generate substantial sales overseas. A year ago, the U.S. was the "best house on a bad block." Now other regions will enjoy faster growth, and investors should look to diversify their country risk, Subramanian says. Analysts are taking account of this in their earnings-estimate revisions, she adds. The reversal of fortune might already have begun. In mid-November, as the market began to gain confidence in global growth, and as worries escalated that our elected officials would send us over the cliff, the purely domestic decile of the S&P 500 began to underperform relative to shares of companies with a large percentage of foreign sales. It had outperformed since April. The market's largest stocks haven't performed as well as the broader market in 2012, and that, too, could change in 2013. The Dow Jones industrials, which include some of the world's largest-cap companies, are up just 8% year to date, versus a 12% advance in the S&P 500. Most Dow components also could benefit because of their hefty overseas exposure. Exchange-traded funds offer another way to play the mega-cap theme, says BlackRock's Koesterich. Along with their underperformance in 2012 and an average price/earnings ratio of about 12, the market's giants have the highest returns on equity and are a "safe place to hide for an investor worried about U.S. growth," he says. BlackRock sponsors the iShares S&P 100 Index fund (OEF). Some other options include the SPDR Dow Jones Industrial Average fund (DIA) and Vanguard Mega-Cap 300 Growth (MGK). The majority of the S&P's incremental profit growth likely won't be as concentrated next year, according to Morgan Stanley. Parker, the company's strategist, thinks sources of growth will be more diversified than in 2012, when just 10 stocks, led by Apple (AAPL), provided 88% of the marginal profit growth in the index. Next year, he figures, this year's top 10 will provide only 34% of incremental growth. Technology stocks, up 12% this year, and industrials, up 11.5%, are strategists' favored sector plays for 2013. A resuscitation of growth in China and elsewhere suggests that crude oil, gas, and coal prices will rise, which means the energy sector, this year's second-worst performer, also could be a winner. Industrials, too, will benefit from a pickup in China and emerging markets, and from potentially fewer-than-expected government-spending cuts in the U.S., says Parker. The stocks have undemanding valuations and haven't been falling much on bad news, he notes. United Technologies (UTX) and Caterpillar (CAT) are two names in his strategic portfolio. Tech stocks are profitable and, with a forward P/E ratio of about 11, cheap versus historical levels, notes BlackRock's Koesterich. Tech also is highly levered to international sales. "When we get an upturn in capital expenditures, it will show up in tech first," Barclays' Barry Knapp advises. Nonresidential fixed investment, or capital spending, is about 10% of GDP, he notes. That is at the lower end of the 9% to 14% range that has prevailed since 1947, suggesting there is plenty of room for expansion. "We like tech in the global cycle," adds Federated's Auth. "There are global U.S. companies in the sector that are better credits than the U.S. government." He favors Qualcomm, which he calls the premier "arms dealer" to warring mobile-device makers Apple and Samsung Electronics (005930.Korea). As for likely laggards in 2013, the strategists cite defensive sectors, including consumer staples (up 10% year to date), telecoms (up 14.5%), and utilities (down 3%). The pitfalls: rich valuations and potentially slower earnings growth. Investors have been drawn to telecoms and some utilities because of their higher dividend yields, says Prudential's Praveen. But telecoms now sell for more than 17 times earnings, and utilities, for 14. The market could move away from yield plays in the coming year if stock prices advance or tax rates on dividends rise. The telecom sector has a 76% dividend-payout ratio, adds Goldman's Kostin, noting that raises concerns about sustainability. Kostin is underweight consumer staples, and forecasts that the sector will have the lowest earnings growth among S&P sectors in 2013. The shares trade for 15 times earnings, and better economic growth elsewhere, combined with a higher investor appetite for risk, could dull their performance in the months ahead. If the yield on the 10-year Treasury bond, currently 1.7%, were to revert to its latest five-year average of 2.9%, the implied bond-price loss would be 7%, according to Goldman Sachs. While the Street's current bullish consensus might seem sensible, many things could upend it next year, to the detriment of investors. Heading the list would have to be a flying leap over the fiscal cliff, which could send the stock market down 15% to 20%, into bear-market territory. A protracted battle to resolve taxation and spending issues also could take a toll on stocks. While U.S. financial markets lately have turned their gaze from Europe to Washington, more debt problems in the euro zone also could be a drag on U.S. stocks. The European Union has 27 sovereign nations, each with its own agenda, but Germany's doesn't seem to include bailing out the most profligate of the bunch. Europe has reduced the risk of a near-term country default and a financial seizure, says Jeffrey Knight, head of global asset allocation for Putnam Investments. The debt agreements this year "have bought time -- all of 2013 -- to address the structural problems, but I'm still concerned long-term," he says. Other risks that threaten a rosy 2013 outlook include the potential for emerging- markets growth disappointment. The Chinese stock market and China's economic data have improved lately, but that positive trend might not continue. China's health, and Germany's, too, for that matter, depend heavily on demand outside their borders picking up. Violence in the Middle East is always a worry, and could cause energy bottlenecks, leading to higher oil prices. And then there's the rest of the world. "We spend a lot of time worried about the Middle East, but risks can occur anywhere," remarks Citi Research's Levkovich. "The most dangerous place you can be is the place where you think there is no danger." Our strategists have weighed these risks, and still come out with a bullish 2013 forecast. Their collective rationale for how and why the market could rise appears sound, at least for now. Now all that's needed for investors is a little bit of luck.